The Certrified Public Accountant Exam is taken in order to become licensed as a CPA. Eligibility requirements will depend on the jurisdiction for a variety of accounting jobs; read more here. This test is designed to only let people become CPAs if they can show that they have the entry-level understanding and proficiency needed to shield the public interest from harm, while working in a career that requires understanding of a quickly altering business and economic atmosphere. 4½ hours for Auditing and Attestation (AUD) – Includes both multiple-choice items (70%) and case studies (30%). The content for this section includes: planning the engagement, internal controls, obtain and document information, review engagement and evaluate information, and prepare communications. 2½ hours for Business Environment and Concepts (BEC) – Includes three groups of 24 or 30 multiple-choice items. The content for this section includes: business structure, economic concepts, financial management, information technology, and planning and measurement. 4 hours for Financial Accounting and Reporting (FAR) – Includes three groups of 24 or 30 multiple-choice items. The content for this section includes: concepts and standards for financial statements, typical items in financial statements, specific types of transactions and events, accounting and reporting for governmental entities, and accounting and reporting for nongovernmental and not-for-profit organizations. 3 hours for Regulation (REG) – Includes three groups of 24 or 30 multiple-choice items. The content for this section includes: ethics and professional responsibility, business law, federal tax procedures and accounting issues, federal taxation of property transactions, federal taxation of individuals and federal taxation of entities. For the groups of multiple-choice items, candidates may only revise questions from the group they are working on at the time. Candidates cannot go back once a particular group has been completed. For this test, candidates receive either a pass or fail. The scaled score will be in the 0-99 range, and the minimum score needed to pass is 75. 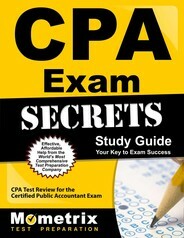 Ace the CPA test using our CPA exam study guide with practice questions. 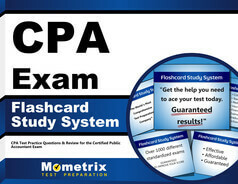 Quickly Solve Difficult CPA Test Questions with the CPA Flashcard Study System.